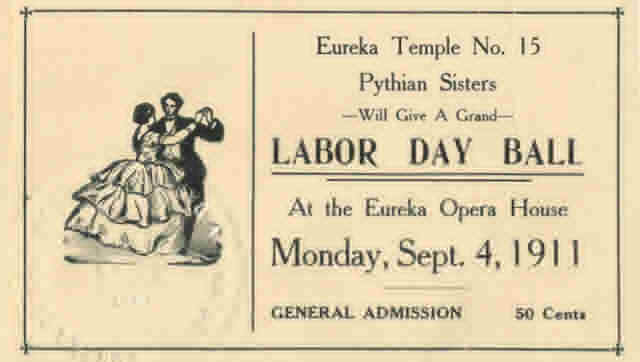 The Eureka Opera House was built on the ashes of the Odd Fellows Hall, destroyed by the great main street fire of August 1879. The Opera House was used for the first time for the New Years Eve Costume Ball in 1880. The November 11, 1880 Eureka Daily Sentinel is Quoted as follows: "The building is, according to the plan of work now being carried on, to be thoroughly fireproof, built with masonry (volcanic tuff) walls, brick and iron front, and slate roof. "From the basement to dome the new theatre will be furnished as none of the class have ever been in Eureka. Its arrangement is pronounced to be first-class, for ventilation, for heat, for means of egress in case of fire, and in fact for a thousand and one reasons it is bound to be a beneficial and permanent monument to the memory of those who have erected, and who will so soon elegantly furnish the same for the edification of our people." 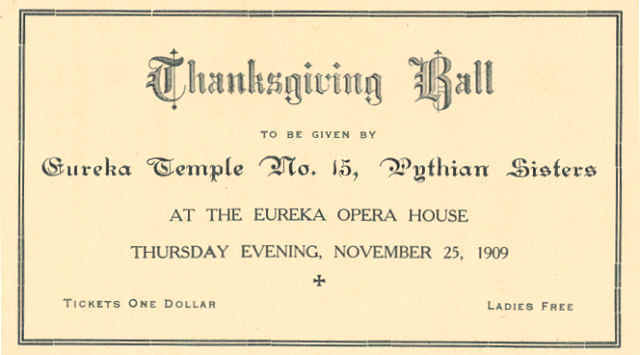 The Opera House has always served as a gathering place for the people of Eureka. 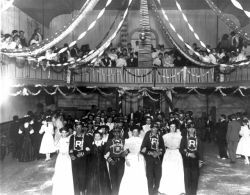 It has been the site of entertainment of all types as well as the annual Nob Hill Fire Company Masquerade Ball held every year from 1880 until well into the 1900's. The first silent movie was shown in 1915 and then in the 1920s the opera house was changed into the Eureka Theatre and talkie shows were presented. In 1923 the original oleo curtain on the stage was destroyed by fire and was then replaced with the curtain with advertisements from local businesses from 1924. The last movie was shown in 1958 and the building had fallen into disrepair. In 1990 Eureka County acquired the structure and began a three year restoration. The building received the 1994 National Preservation Honor Award after being reopened on October 5, 1993. Today the Eureka Opera House is a full service convention center and Cultural Arts Center. The building is used for conventions, meetings, and community functions as well as cultural presentations. The historic elements such as the original projectors from the early days of the silent movies, the first "talkies" projector, and a carbon-arc spot light are on display. The 1924 Oleo curtain still hangs at the front of the stage. Historic graffiti has been preserved back stage from the early days and the tradition has been continued with signatures of the people who have performed at the Eureka Opera House since it was reopened.